“At the end of September 1976, invited by Giorgio Persano, I decided to create “100 Exhibitions in the month of October” in his gallery. How? By thinking of them and describing them all in that month, and numbering them from one to one hundred, so they could be immediately printed in a (yellow) booklet measuring 9 x 9 x 1.5 cm presented in the gallery as a completed work in itself, but simultaneously extended into the future, which is when the exhibitions described could actually be arranged, both by myself or by others. To date, I have personally organized a certain number of those exhibitions and other artists have drawn inspiration from them, like from a recipe book. Now, 42 years later, one of these is being hosted in the same Galleria Persano. Giorgio Persano has made the choice, which I wholeheartedly agree with, and it is the number one hundred. It states: the exhibition shall be suggested by the venue. Time has passed and since October 1976 my work has come a long way, to the point of the creation of a foundation called Cittadellarte, in Biella. This is an institution that places art in direct relation with the different sectors that make up society by activating a process of regeneration that extends into society itself. 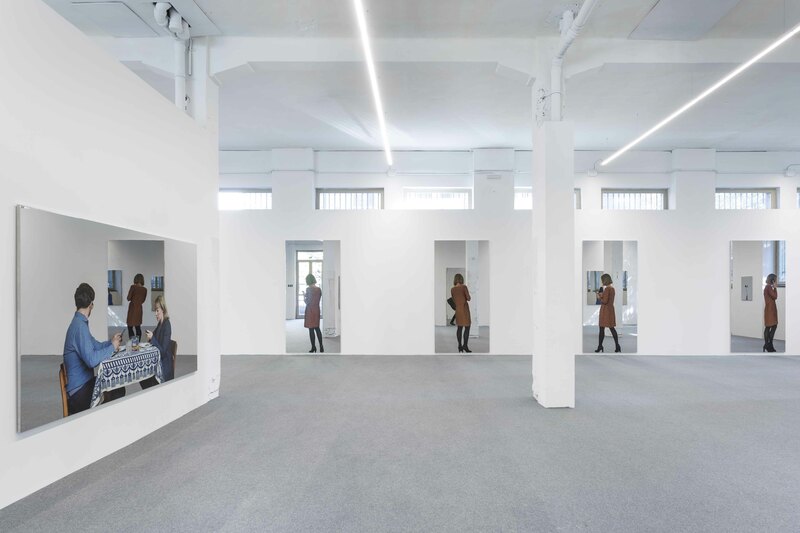 In the meantime, the Galleria Persano has changed its location and size, moving into a former industrial space in Turin. 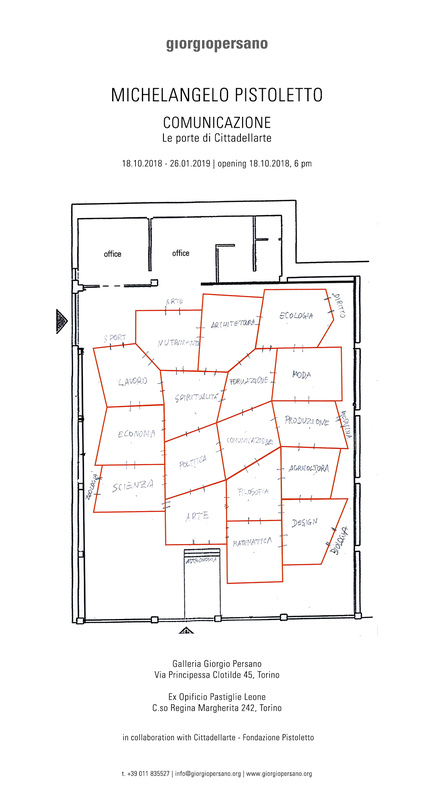 As I did myself, choosing a former textile factory to set up Cittadellarte. Now, with the last of the 100 exhibitions enumerated in the yellow booklet, we ideally and practically extend the small 9 x 9 x 1.5 cm parallelepiped, expanding it to a spatial dimension corresponding to the current places and activities, both as regards the Gallery and my activity, today mostly dedicated to the Cittadellarte. My work once again intertwines time and space, articulating itself in a thick network of interconnections and communications. 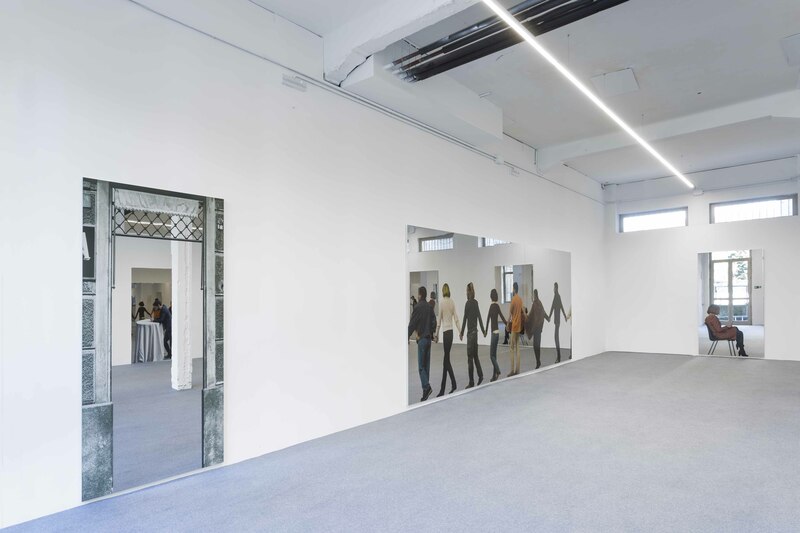 The doors of Cittadellarte installed in the Gallery connect seventeen rooms that divide the entire exhibition space and represent so many sectors of social structure. Communication is in fact the title that I have assigned to this hundredth exhibition in the yellow booklet. However, it is not limited to a single place, but is divided into two venues. 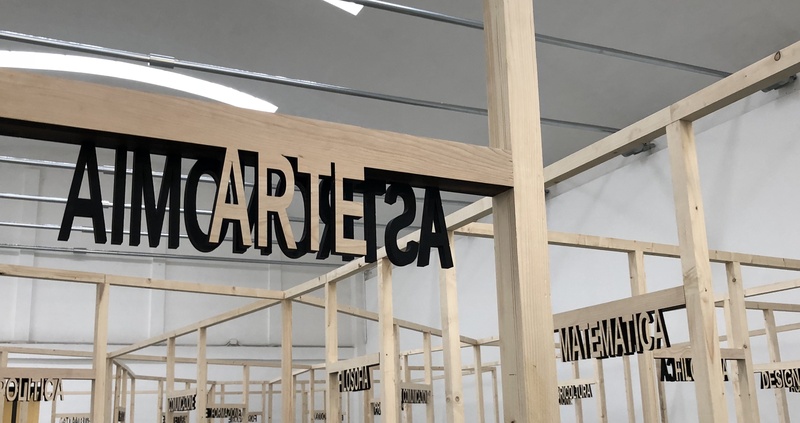 In the second venue, separate but not far from the first, a group of Quadri Specchianti are exhibited and specifically exploring the topic of communication. Harking back to a relationship begun almost 50 years ago, Michelangelo Pistoletto inaugurates an exhibition at the Galleria Giorgio Persano that unfolds in two directions: a large conceptual installation that completely occupies the space of via Principessa Clotilde and an exhibition of many mirror paintings in the adjacent former Opificio Pastiglie Leone. 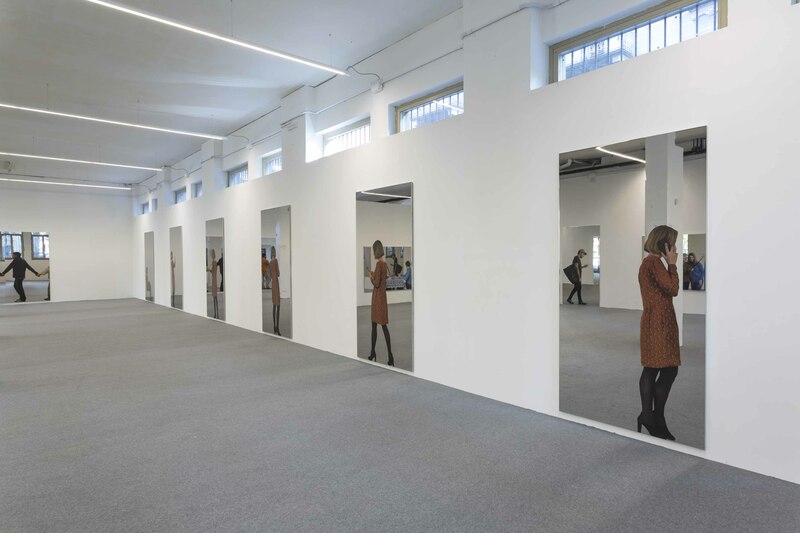 The installation in via Principessa Clotilde is a tribute to human industriousness and marks a strong declaration of intent by Pistoletto. 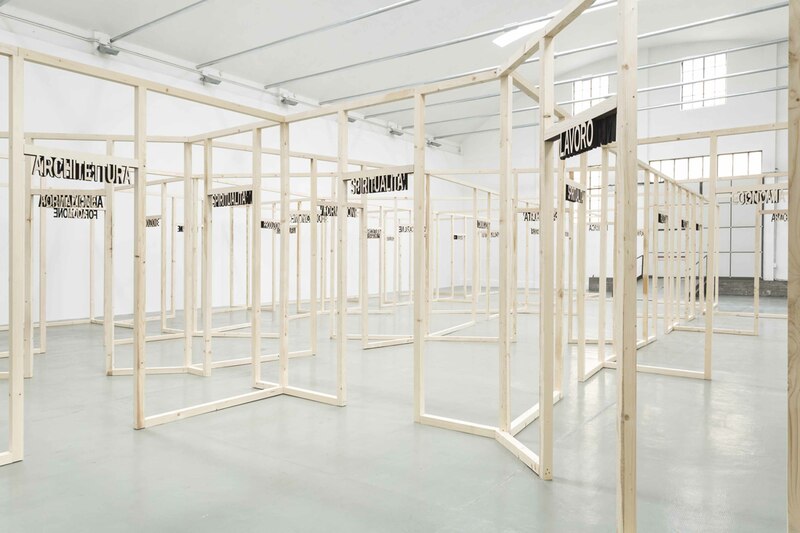 A rough wooden structure is shaped to form seventeen open spaces, named after the different sectors of the social structure. 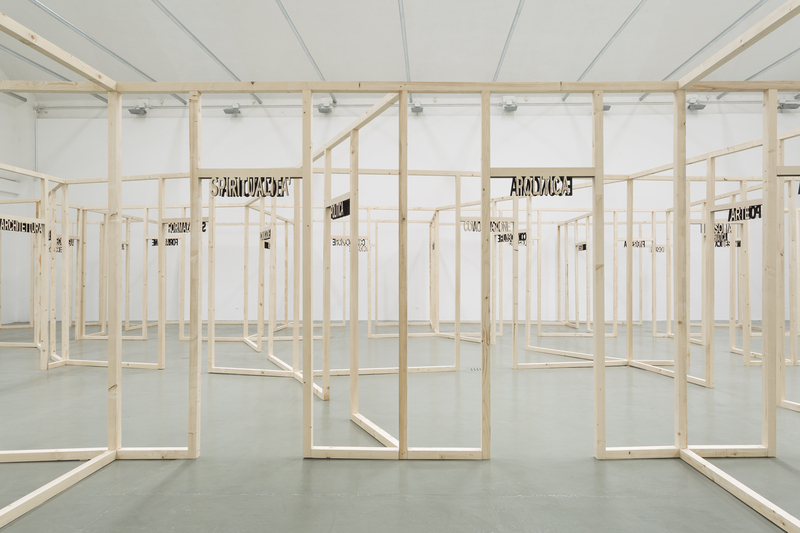 These cells, although independent, are part of a single organism and, interconnected, make up the system that links art and society. 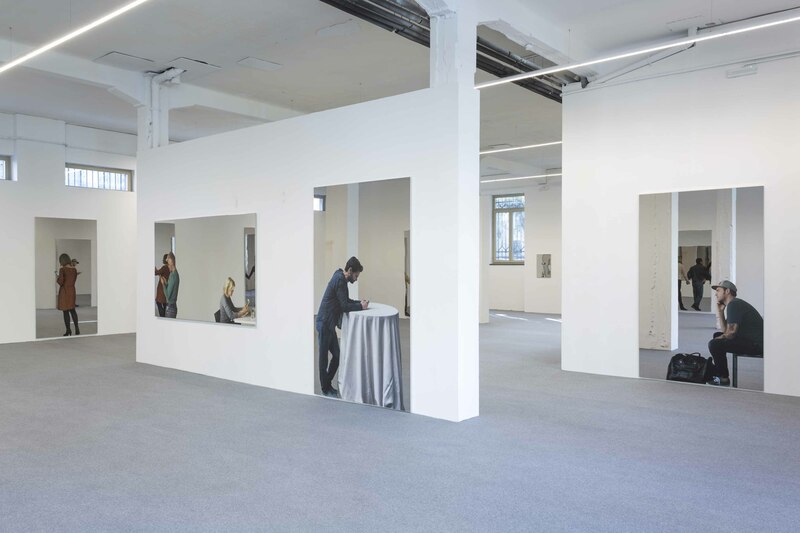 The exhibition continues in the spaces of the former Opificio Pastiglie Leone, a historic site of Turin’s industry. Here, human relationships are shown in their most contemporary light. A group of mirror paintings fix moments of everyday life conversations mediated by digital devices. The subjects shown seem to isolate themselves in their gestures, bringing the viewer even closer to seeking a dialogue with them. 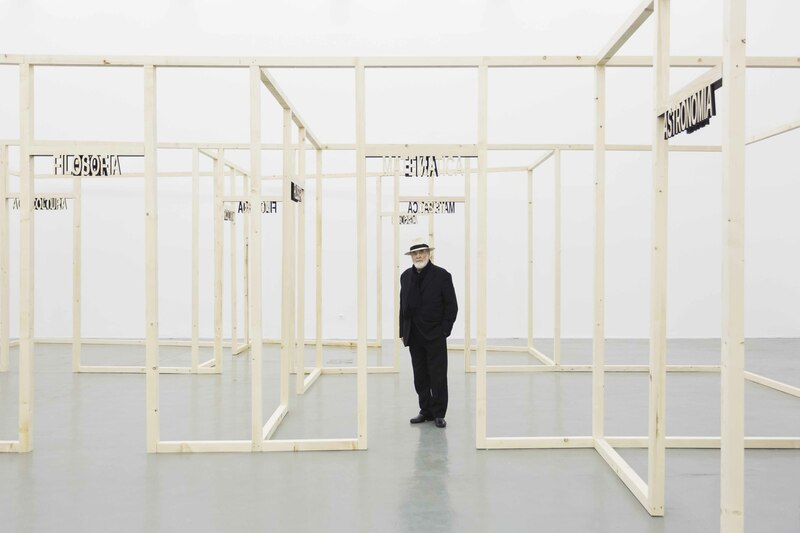 Therefore the art of Pistoletto develops through the theme of communication, both as an architectonic-symbolic-conceptual construction, and through sequences of images, which represent the present and time.